Now let's look at Figure 3-2. If you create a standard two-by-two grid, segmenting salespeople and buyers into two categories, you come up with four possible buyer/seller combinations. Figure 3-2: Who Ends Up Selling to Whom? This grid shows how 100 percent of all selling situations are distributed across our four combinations. For example, if early-market buyers are 20 percent of selling situations and customer-focused salespeople are 10 percent, then that combination results in 2 percent of the overall total. 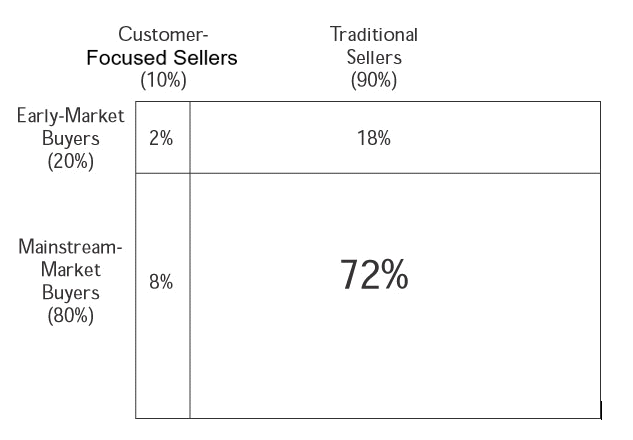 In other words, 2 percent of selling situations consist of customer-focused sellers calling on early-market buyers. This situation yields the highest ratio of success. In fact, it may be overkill, because the early market typically buys; it doesn't have to be sold. Similarly, 18 percent of selling situations consist of traditional sellers calling on early-market buyers. Let's assume the traditional salesperson is capable of delivering the standard PowerPoint presentation that describes the new offering as if it were a noun. Early-market buyers are willing to endure a "spray and pray," and are also capable of determining if this offering can be used to their benefit. Despite the fact that the salesperson cannot describe how the offering could be used, the vendor still has a high probability of a sale. The biggest challenge, in this case, is finding those early-market buyers. In 8 percent of selling situations, customer-focused sellers are calling on mainstream-market buyers. This is the best use of a customer-focused seller's talents. The mainstream-market buyers need help in understanding what the offering will enable them to do, and how they will benefit as a result. The customer-focused seller has the ability and patience to navigate through the buying cycle and maximize the chances of getting the business. The most disturbing fact that emerges from this chart is that 72 percent of the time, salespeople who are selling risk (that is, focusing on technology and features) are calling on people (mainstream-market buyers) who are highly risk-averse. Buying cycles with this combination are arduous, at best. In our 72 percent zone, a far higher percentage of sell cycles end with no decision. For example, in our experience, information technology vendors selling to the mainstream market win about 15 percent of opportunities that go to the end of a decision cycle, and another 15 percent of the time, a competitive vendor wins. But in a discouraging 70 percent of these situations, buyers make no decision at all. In the late 1990s, vendors of technology had the huge advantage of the looming Y2K threat, which forced mainstream-market buyers to make decisions in a hurry. Absent that kind of external pressure, these buyers would have been far less likely to move—and the salespeople of the day would have had far less reason to be smug. We worked with a CEO who concluded that there was no early market for his company's offerings—that is, no easy sell. He then took it a step further: He also concluded he had no customer-focused sellers within his sales organization. His calculation of who was calling on whom was simple: 100 percent of his sales situations were the least desirable—traditional salespeople calling on mainstream-market buyers, which can be considered as having the inept call on the unable. Figure 3-3 is simply another way of illustrating that the majority of a potential market is postchasm and that therefore potential buyers are unable to understand on their own why they need a new capability or technology, or how they might use it. 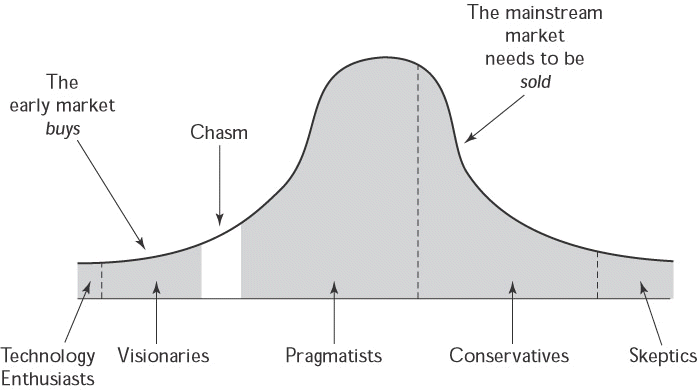 For companies selling technology, delays in crossing the chasm can be devastating. While most everyone would agree that delays provide competitors time to catch up and adversely affect overall market share, many have not considered the impact of price erosion as a technology goes through its life cycle. Companies with unique offerings can command a premium, but as other companies enter the market, there is a tendency to migrate toward commodity pricing. In the late stages of a product's life cycle, reduced pricing is often the tactic to stay competitive with newer technologies. Companies failing to cross the chasm are adversely affected by both lower market share and margins. 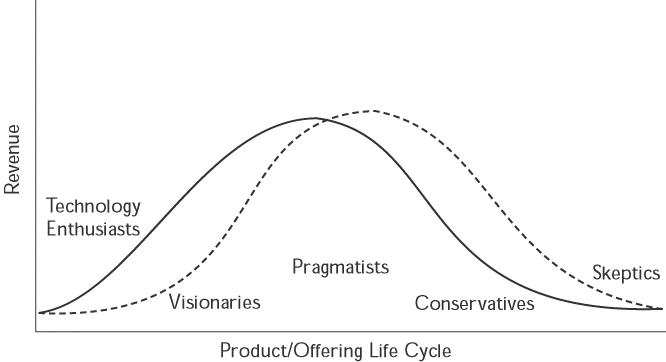 Figure 3-3: Waiting for the Mainstream Market to "Get It"
We tell our clients that if they start preparing to sell to the early majority (the pragmatist) from day one, they can virtually eliminate the chasm and change the shape of the bell curve in Figure 3-3 by bringing in mainstream-market sales sooner. Note in Figure 3-4 that the duration of the product life cycle does not change but that now the categories of buyers can be sold to concurrently rather than serially. By empowering traditional salespeople to have conversations about usage with Key Players, Marketing can accelerate acceptance and market share at higher margins. If time to revenue is the question, then Sales-Primed Communications from day one is the answer. What happens when a company fails to drive top-line revenues? The most common result is mutual finger pointing by Sales and Marketing. We believe that both Sales and Marketing have failed to do their jobs. Traditionally, there is a great deal of tension, even conflict, between these two functional areas. Later in this resource, we'll explore this relationship more closely, and offer a definition of an appropriate interface between Sales and Marketing. In summary, there are circumstances in which new offerings can enjoy success even without Sales-Primed Communications being made available to their sales organization. As markets and sales organizations mature, however, penetration of the mainstream market almost always proves to be more challenging (a.k.a. "hard rock mining"). To sustain success, companies have to realize how different mainstream-market buyers really are, and act on that insight. Mainstream-market buyers don't buy; they need help in understanding how an offering can enable them to achieve a goal, solve a problem, or satisfy a need. So, companies can maximize their chances of prospering if they enable their growing number of salespeople to have conversations with buyers in a way that positions offerings more consistently, leveraging best practices.